Trees, though a symbol of unwavering strength, are just as susceptible to diseases and pathogens as the rest of us . Here in Michigan, there are a variety of diseases that could attack and infect even the strongest of trees. Conifers and deciduous trees alike can be susceptible to a variety of diseases that can lead to tree degradation and even death. 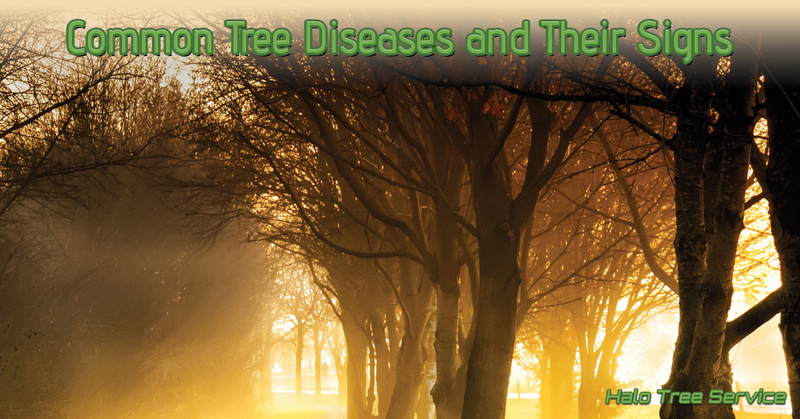 Learn about some of the most common tree diseases here in Michigan and what we here at Halo Tree Service can do to help you manage infected trees. Dogwood Anthracnose is a disease that affects dogwood trees by way of a fungal pathogen. The pathogen was first imported to the Kalamazoo area in the 90s and has since been destroying the dogwood population. It’s usually difficult to detect symptoms of the disease, as symptoms often pop up on small twigs and branches. The symptoms manifest with small black spots across dogwood leaves and twigs. Dogwood Anthracnose is spread through raindrops and overhead watering. The best way to prevent the spreading of this disease is to plant dogwoods a good distance away from other dogwood trees. If you suspect some of your dogwoods are infected, contact us about trimming trees that are infected. Oak Trees are a staple of Michigan’s beauty. Unfortunately, due to the introduction of Oak wilt disease, many of these beautiful trees are in danger. Oak wilt is a deadly fungus spread from tree to tree via sap-feeding beetles. Upon infection, Oak wilt can take down trees in a matter of weeks. Trees that are most susceptible to Oak wilt include freshly pruned trees and injured trees. Therefore, it is crucial to know when the right time to prune trees is since Oak wilt can be so devastating. If your Oak Tree is dying due to Oak wilt, our tree cutting service is experienced in removing dead trees and helping to prevent the spread of disease in its tracks. Black Knot disease is a fungal pathogen that attacks plum trees and cherry trees. The disease manifests through black bulges and swellings on the branches of trees, thus giving it the name “black knot disease.” As the knots grow, they could become infested with insects. For plum and cherry farmers, Black Knot could become quite the nightmare. This disease is spread in the rain when temperatures hit about 60 degrees fahrenheit. It’s recommended to remove infected branches during the tree’s dormant season. Branch cutting could also be completed during the growing season if the swelling is expanding. Most importantly, make sure to burn all of the infected branches. Most tree diseases are dangerous to the livelihood of neighboring trees if left unchecked. Therefore, it’s crucial to understand the steps to prevent the spreading of fungi before it’s too late. Understand the tell tale signs of Michigan’s more common tree diseases. Additionally, know when it’s appropriate to begin pruning trees or trimming trees and contact Halo Tree Service with help in dealing with diseased or dead trees.